Pingback: TheMoneyIllusion » No more jobs mystery. Period. End of story. I have never been to Brazil, but if Mr. Nunes is typical of his countrymen, they are one set of smart hombres. (I hope “hombres” is Portuguese–I am limited to Spanglish). Why do I have to go to Brazil to read intelligent economic analysis? (To be fair, Scott Sumner is excellent also). Benjamin Thanks for the kudos. Blogs are great because you don´t have to travel. Just in front of the computer and read, write and make friends (and adversaries). But if you´re ever down here let me know. I hope someday to visit Brazil, and would count myself fortunate if we were able to meet. Keep blogging! Great post and very sobering. Note: your first graph has a growth rate label when it is a level. Thanks for the alert. Of more than 900 readers of this post you were the only one to catch the labelling mistake. At least the only one to tell me so! BTW, one obvious plausible cause of the ‘Great Moderation’ is that the share of economic growth going to the bottom 50% of the USA population went to near zero. Another way of looking at it is that half (and now most) of the USA became expendable ‘shock absorbers’. Barry. I must say I didn´t understand your argument. Incorporating updated data is important, but one must be careful in using it. 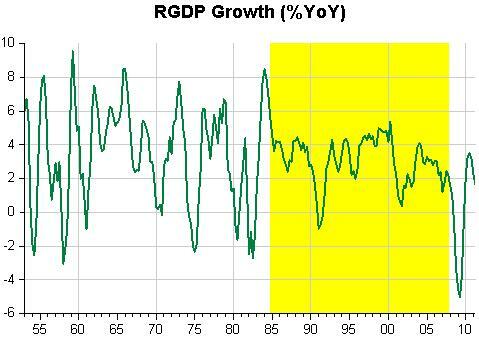 For example your chart of RGDP y/y changes is using prior updated data, not the data the decision makers were using at the time. 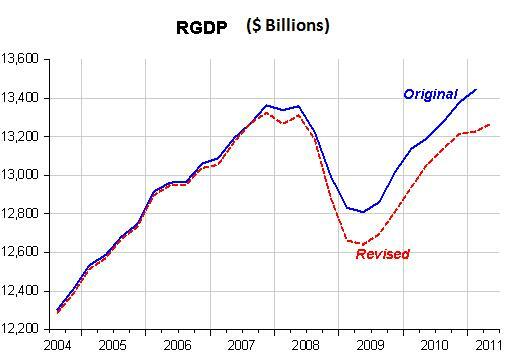 The RGDP changes for 2005-2007 got a substantial downward update late in 2007 (household consumption was reduced.) Prior to that update the RGDP y/y changes for those years showed an upward trend, so the central bank’s actions need to be reviewed in the light of the data in use at the time of the action. Operating under the data as it was known at the time, Dr. Bernanke took the discount rate up more, faster than any other Fed. 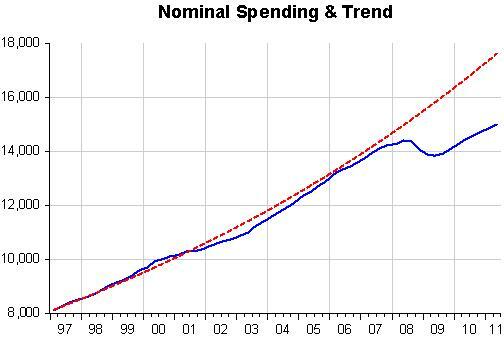 The Fed zigged when the data said zig, unfortunately the data has been revised to say zag.